"Let the heavens be witness to your doom." Shredder is a complex villain with a history full of confrontations with the Teenage Mutant Ninja Turtles. Those confrontations have often left both sides battered and bruised, but in Teenage Mutant Ninja Turtles: Shredder in Hell #1 from IDW Publishing, Shredder is on the receiving end of even more abuse. The issue is written and illustrated by Mateus Santolouco, colored by Marcela Costa and Santolouco and lettered by Shawn Lee. Santolouco is certainly content to put Shredder through hell--both literally and figuratively--in an effort to make him a fiercer fighter in the long run. 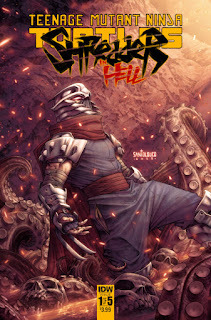 Santolouco does so by thrusting Oroku Saki into a version of the afterlife that forces him to confront just about all aspects of his being, including Splinter, Takeshi Tatsuo (the former Shredder) and the woman he loves--all of whom want different things from Shredder based on their perspectives on life. It's a very profound approach to the character, in that Santolouco knows there's so much more to him than just what's typically a distillation of his garb and fiery hatred of the Teenage Mutant Ninja Turtles. The dialogue applies a heady weight to the story and makes it feel larger than life. And Santolouco know that Shredder is up to any challenge that gets in his way which makes the first issue a fascinating breakdown of his psyche. Santolouco also handles the artistic duties in the book and his illustrations have an anger behind them that's certainly befitting the titular character. Shredder always seems to come across as exhausted and worn, but he's never made to look weak or like he's giving up; rather, Santolouco maintains a strength that always seems to be simmering. The linework is very clean and Santolouco provides plenty of looks at (primarily) Shredder's facial expressions which reflect the aforementioned weariness. The panel layouts also provide a sense of frenetic energy to the otherwise philosophical story as Santolouco throws in an array of pattern designs and sizes. Costa's (and Santolouco's) colors do a great job of capturing the atmosphere of the various locales that Shredder seems to find himself in. Teenage Mutant Ninja Turtles: Shredder in Hell #1 is a fascinating deconstruction of a very nuanced villain. Shredder has typically been defined by his rivalry with the Teenage Mutant Ninja Turtles and him being able to take something of an introspective journey will provide for a better understanding of his motivations. Santolouco does a great job with the story, seamlessly carrying Shredder through all manner of hell in his pursuit of the truth. Santolouco's artwork is a perfect fit for the character and the tone, tapping into a savageness that serves as an undercurrent for the issue. Teenage Mutant Ninja Turtles: Shredder in Hell #1 is a great issue that fans of TMNT will definitely want to check out, but it also manages to stand on its own as a look at a unique character. Teenage Mutant Ninja Turtles: Shredder in Hell #1 is available now.